It all started in 2009 and I was living in a love hotel in Seomyeon, Busan, Korea. It was the only place that I ever lived in that had a round bed. It was nice and firm too, which is more common in Asia. Most beds in the States are kinda mushy. What brought me to the love hotel? Well, I had finished one contract and I was looking for another job and considering other possibilities. Finding accomodation on your own in Korea is often not easy or cheap. You often have to pay thousands of dollars for a deposit (jeonse & wolse). Anyways while staying there I read the 4 Hour Work Week and I got an idea. My idea was to make a video guide for teaching abroad. I wanted to make how-to videos that would be recorded in the clasroom so that people could see how to do things. 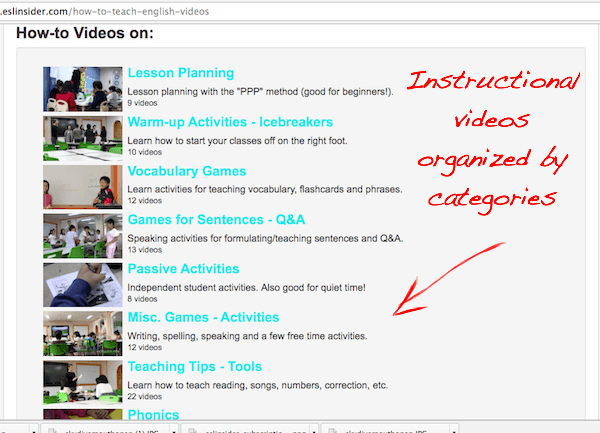 It's a lot easier to learn how to teach English when you can watch other teachers. That's what the research says too. For me the biggest challege of teaching abroad was finding materials that worked and that were easy to digest. Whenever I tried to look for something new to use in my classes online I would google and just waste a bunch of time looking for stuff that worked. Then it was often just reading someone else's unclear instructions on how to do such and such activity. 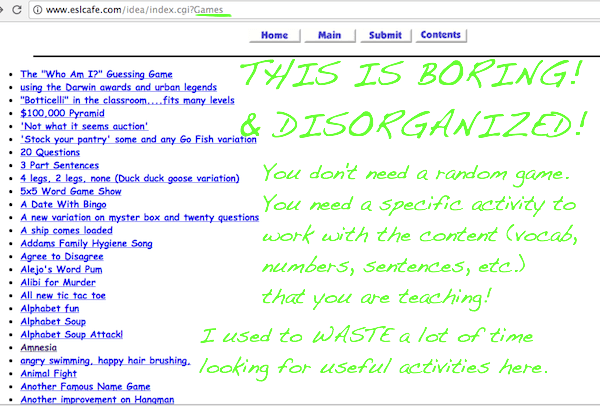 I used to look at sites like this one to try to learn some new activities. But it was disorganized, boring and illegible. Now compare that to what you'll find on this page. I learned a fair amount by watching other teachers. So I knew video would be way better than text for learning. It's better because it has context and it's quicker. Think about it. Would you rather read an instructional manual or have someone show you instead? Anyways so I decided I would do that. As I mentioned one idea I had was with the how-to videos. The other was to interview teachers in China, Korea, Taiwan and Japan. It sounded big and so I did it. But actually before I did I also decided it was a good time to go to Hawaii for a break. I thought it would be good to start things out with a skydive. The skydive (which started at 12,000 feet) was sort of symbolic for me to start something new, something scary, and something that might not work. There I also bought a Mac - the same one that I am writing on now. How's that for longevity? It's been running for 8 years or so. Then after Hawaii I went to Japan for a few days and bought a video camera. While there I interviewed some teachers in Tokyo. After Japan I went back to Korea for a bit. I was all over the place then and I was also considering moving back to Taiwan or China. But I went to Taiwan. While in Taiwan I bumped into an old friend Dale. I think his interview was probably one of the best ones. Since we were friends his interview probably came across as more natural than some of the other teachers I accosted in the street. It was in Taiwan that I made my first how-to video. I made two of them actually while subbing in a school in Koahsiung. In retrospect I think I could have done a better job with the interviews and questions that I asked. But I still got a few good ones as of now that I have compiled in regards to advice and challenges. I can't remember when I went to China for those interviews, but I went back to Korea. I decided I would try to get a job there so I could start filming my classes. I found some work in a kindergarten in Sinpyeong. I think it was for like a month. I moved out there too. There was this cool little mountain there that had these little deer that you could see in the woods. Anyways I started filming my classes there. A lot of the videos with the really little kids were filmed there. Like this one. After that job things got a little rough. I didn't find a job I liked and nor did I have a house to stay in. So I lived in a jimjilbang for like 6 months. Make sure you go to one if you're in Korea. However you're probably not going to want to stay more than one night in one. It's a great place to bathe, clean and relax, but there is no bed. 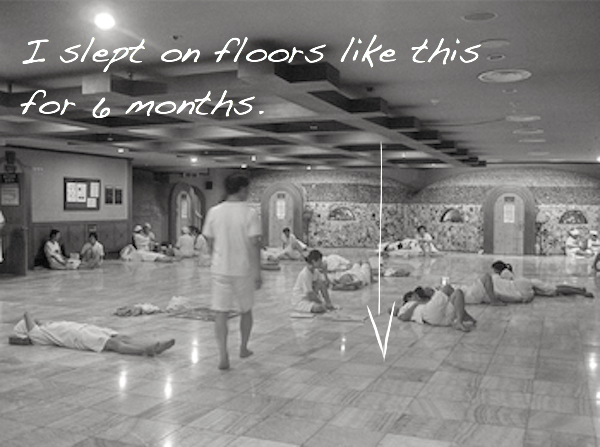 You'll get a blanket and a hard floor to sleep on. I probably went to like 6 or 7 of these in Busan. They are only around $5-10 a night. I wanted to get my project going, but I couldn't find much work then with me being picky. I did find a position in Hwamyeong, Busan teaching in a hagwon. Here's a video I made with a fun group of girls from there. Eventually I found a full time job, but I had to move out of Busan for an after school position in a public school. That whole experience didn't really turn out well and you can read more about it here. But I got a job and I had an environment to do what I wanted. I took a visa run and interviewed a few more teachers in Fukuoka and then returned to work in Changwon. I made a lot of videos in Towol elementary school. So after I finished at Towol I stayed in Changwon for a bit longer and I made a few more videos at a school in Masan where I did some subbing. Making the videos started with taking everything that I thought was useful that I already had learned while teaching in Korea and Taiwan and then learning some new stuff. I read a few books, took some of what I learned and made videos. I started to attend workshops with KOTESOL. The bottom line was that I learned faster and better by watching other teachers who were better than me. That was why I did it. I knew what worked for me would work for others, because even if I was lazy I knew that there were other teachers like me. There are a lot of people in the TEFL industry who say things like you need an in-class TEFL course to learn and online courses are bogus. It's kinda dogmatic, but it's easier to learn by watching and that's what those videos did. They made learning how to teach easier. I am pretty proud of those videos. I mean they are not everything for every teacher out there, but if you follow a path like I did I think you'll find them pretty helpful. So after Towol I started to work on my website and videos. In retrospect I would have done things a lot differently had I a crystal ball. Now this idea started with the 4 Hour Work Week, but I wish I had read the book Crush It by Gary Vee instead which came out at a similar time. The reason being is that the 4 Hour Work Week sounds easy, but man more than a year had passed since I started working on this site. It was not easy. Part of it too was that I think I wasn't a natural teacher. Gary Vee talks more about hard work. In retrospect I think his work which I only fairly recently came across is way more valuable than the 4 Hour Work Week. I mean I think it's the title that sold it. Who doesn't want to "escape the 9-5 and join the new rich"? Trust me I can tell from experience that any idea you have for making money is probably not going to be easy. What's easy?! Anyways I had made most of the videos and I just needed a site to put them on. I wanted to make money, but I needed a website. In 2009 I got the domain eslinsider.com and made a cheap Yahoo website, but I wanted a video streaming website with a subscription model. Back then I didn't know anything about websites. So I paid someone in India to make it on site like Guru. They were totally sketchy, but after a few months and lots of problems I finally got it up and running at the end of 2010. "If I had known before I started ESLinsider how much work it would have taken I don't think I would have started." It was cool, I wrote an ebook too and had all the videos behind a paywall being streamed from Amazon. I was excited, but in the months to follow I only sold one subscription. I just didn't get traffic to my site or really know how to do it. Too expensive? $40-60 a month. So it seemed kind of like a failure, but I knew what I had was valuable. I wasn't going to give up on it. So I thought what if I make it free? I had already uploaded to Youtube a preview of the how-to videos (160,000+ views) and interviews in September of 2010. But I thought if I made it free then maybe I could make money from it with advertising. Which as of now is usually around $20 a month. Youtube is not a big money maker for most. I started a new channel in 2011, uploaded over a 100 videos and it now has over 1,300,000 views. So I guess this post turned more into a tangent or timeline of ESLinsider. But I guess the reason why I made ESLinsider stemmed from the fact that I learned a lot by watching other teachers. Video is a lot better than text when it comes to this. 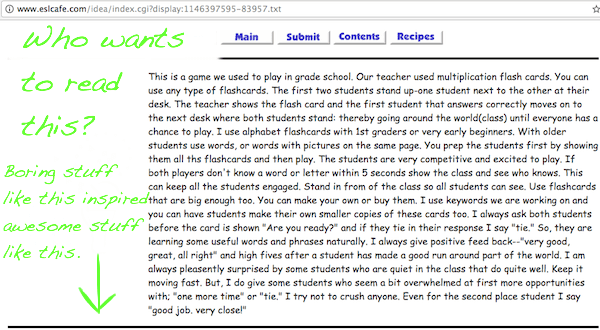 I mean you can read text if you want, but with videos you can see right into the classroom. You can see the students and quickly learn. Another reason was that I thought the TESOL course I took sucked especially for a $1000, but I didn't realize that until I started teaching. I'll tell you what, I learned 2 activities in that course that I turned into videos. You are extremely fortunate because YOU CAN LEARN WAY MORE FOR FREE!!! If you are going to teach mostly kids in Asia like I did then I don't think you can find a better program. Also the take home part of the course that I took included a couple of large books with slightly better formatting than the above pictures, but reading them was so boring. In the web world many TEFL course companies just tell lies to get you to buy. I was told lies and I didn't want anything to do with that. I think most newcomers don't know sh*t about TEFL courses and believe all the hype that they are told. It's like they're telling you what you need and what teaching abroad is like, but a lot of it is b.s. And I think a lot of people believe what they are told by these companies because they see them as authorities. But a lot of them are just middle men with vested interests. I didn't want to be like that. I wanted to tell people the truth. It's like all the other TEFL courses represented only a doorway that you walked through once. But you never returned. And maybe that's why so many tell lies. People are always coming and going. There's no loyalty. They just want to make a cheap buck off of you. It's a one time deal. You may leave your course thinking you are done, but what you'll soon find out is that you are going to need more help. So you are probably going to turn to the internet again. And I think that's where the videos come in. You can watch them anytime. You're going to need ideas for class. In the beginning I wanted ESLinsider to be an alternative to a TEFL course. I am not sure if other people saw that or how ESLinsider was perceived then. I didn't want to be like a TEFL course since I was just jaded. Then I started to think well, shoot maybe I should just turn it into a course. I already have the start of one, so in 2012 I made the first course which was extremely basic and does not resemble the current Basic course. There are a few different courses now. While I think the videos are fantastic for many things I know they don't cover everything. So I made the courses with that in mind. They are more well rounded and add another level of training. The courses are interactive and I think mostly enjoyable to take. Over the last 4-5 months I have hopefully made the "Advanced course" more fun by gamifying it a bit. I believe that learning should be fun. If it is fun then you will learn. But if it is not fun like much of the course that I took then you will not learn. Part of making ESLinsider was about fun. Those were the teachers that I enjoyed. I liked the teachers that played games. I liked art, competition and sports. Making ESLinsider has been a lesson in perserverance. I have made some money from it, but the work to reward ratio has been far from skewed in my favor. Watch the video on why I made ESLinsider.